With probably the most impressive dunes on the Lake Michigan shoreline, this National Lakeshore provides a little more quiet than you may get in some of the state-run areas. If you don't mind carrying your boat a couple hundred yards, try launching from North Bar Lake. Paddle across the lake, float your boat through the channel and out into Lake Michigan. 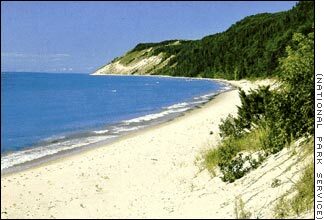 Sleeping Bear Dunes National Lakeshore. Sorry, we have no listings for this lakeshore at this time.